Our Women’s Team is looking forward to another successful season in the Leinster Women’s League. Last season saw us progress into Division 3, where we competed against well-established teams throughout the province. This was a new challenge for the players, but our rugby skills developed to meet the higher expectations of the division. The Women’s Team had a fantastic coaching team behind them last year: Shane Curtis, Paul Mahon, Jason Curran and Neil Hopkins. However, the closing of the season saw us say goodbye to Head Coach, Shane Curtis. Shanes commitment to the team over the past few years was outstanding and he always made certain that the team were well prepared and ensured that we were ready for the transition from Division 4 to Division 3 last season. He left a really good legacy that we can build on into the years ahead, as he brought the women from complete beginners to competent rugby players during his time as coach. His presence on the pitch will be greatly missed this year. Tina Donohoe, our captain last year, unfortunately had her season cut short through injury and has since confirmed her retirement from rugby. We wish Shane, Tina and both their families all the best for the future. Janet Kerr has been appointed Captain for the 2016-17 Season and is looking forward to the challenges ahead. 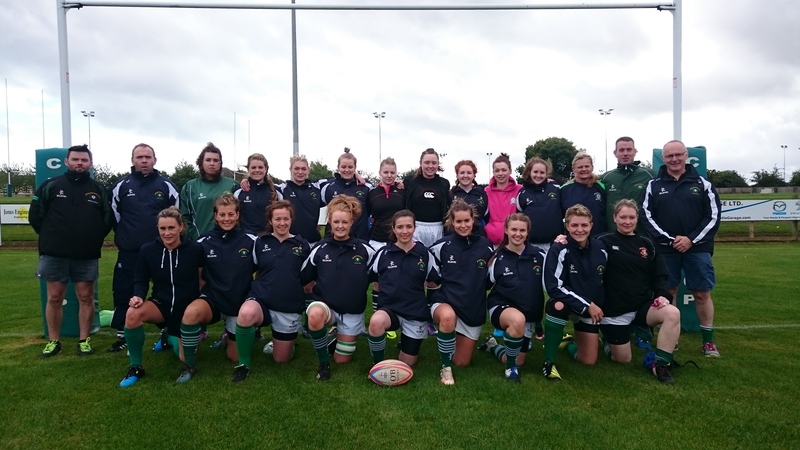 The Women’s Team is a continuously growing sector of the rugby club who are now heading into their 4th season, and after small beginnings really have become an integral part of the senior section of the club. They are lucky to have seen a number of players join them from the U18s Girls’ Team. These players are a great addition; bringing different strengths to the squad. We are also delighted to welcome many new players, who have a wide variety of backgrounds. Some of these women came from other sports, while others are playing with a team for the first time. Their enthusiasm is fantastic, and they are learning the game incredibly quickly! We are grateful for the support received from the Executive, Pavilion and grounds team in providing support, facilities and great pitches to play our matches on. This year’s coaching team members are Paul Mahon, Neil Hopkins and Paul O’Connor. Paddy McCann has also joined us for pre-season, and after a few out-door sessions has moved us into the Gym for Strength and Conditioning sessions which take place before training on Monday nights. The women’s team hit the ground running in pre-season. We had a successful ‘give it a try’ day where we picked up some new players. We also held our first pre-season rugby Camp in mid-August, which included pitch training, a gym session in BPT fitness and a top class lunch in South Beach café before going back to the club to set goals and objectives for the season ahead. Greystones Women’s Team would like to take this opportunity to thank their sponsors: Grove Motors, Newtownmountkennedy and Teach Solais/Lighthouse, Bray. Grove Motors have sponsored their jerseys for the past couple of years. Teach Solais/Lighthouse very generously sponsored jackets for the team. The team are very proud be able to wear their jackets to and from matches, as well as during training, and are always on the look out for new sponsors. If you are interested in joining the team, trainings take place on Mondays and Wednesdays at 8pm. For more details, contact Janet at kerrjanet@hotmail.com or Paul at paul.mahon94@gmail.com.